Ugh, the weather sure is crazy. Monday was a warm 80 degrees. The weather forecast had said that it would rain but since it hadn’t rained all weekend as predicted, I took a risk and I painted the front porch. I began at 9 a.m.–or maybe before–and painted until mid-afternoon. It looks nice. I was going to paint the green trim and maybe the garage door today, but it was too cold. There are frost warnings out for tonight so when I finished all my work today, I went out and covered the plants I had put outside. I also turned the heat back on. Being unable to paint messed up my schedule. I drank coffee as I contemplated how to spend my day. I didn’t want to have an unproductive day when we have less than two weeks before we close on the house. I feel rushed to get as much done as we can because I don’t want to keep coming south AND I want to get our house up for sale soon. I decided to work on the basement. When I last went to the dark basement to find paint, I had managed to find the light to turn it on. I left it on, but EJ turned it back off. So I decided to work in the first of the two rooms of the basement. I got on my work clothes–which is also my paint clothes–including a old sweatshirt–and put a headscarf on to protect my head from spiders and their webs. I went into the basement, but in the small room there is exercise equipment, a chest freezer, and EJ’s work bench piled with stuff. I had no idea how to pack it. I peered into the pitch blackness of the other room. Nope, I couldn’t do it. I changed my clothes. I decided to walk to the post office for our mail and then walk Danny. As I walked I thought that I really need to get a start on the basement. So when I got home, I changed into my work clothes with spider protection head scarf and went into the basement. I put a few things into an empty kitty litter bucket, but I felt overwhelmed by the task of packing EJ’s stuff. I peered into the blackness of the other basement room. Nope, I couldn’t do it. I changed my clothes. I decided to drive to the grocery store. I knew I would have to go sometime this week and I might as well go on a cold day when I can’t work outside and I’m too scared to work in the basement. When I got home, I remembered that we had decided to donate JJ’s dresser. He has had it since he was born–his crib and dresser were a set–and it’s really much too small for his adult clothes. I’ve been wanting to get him a new dresser for years, but never did. I measured to make sure the dresser would fit in the car. Yup. No problem. I took out the six drawers and slid the dresser down the stairs, and carried it and the drawers out into the car. I took Danny with me to the Hospice store. I had worked with the woman who helped me unload the dresser years and years ago–at my first job at McDonalds. I had told her I had a little dresser to donate but when she saw it she exclaimed, “TJ! You said it was LITTLE!” Well, I thought it was little–it’s smaller than EJ and my dressers and is much too small for JJ’s clothes. The woman said, “Did you put this dresser into the car yourself? I don’t know how you did it.” I told her that I had even carried it downstairs. She was impressed. When I got home, I was determined that I needed to get a start on the basement and no darkness or spiders were going to keep me from it. I put my work clothes back on, grabbed a big broom and a flashlight, and swept the spider webs from the ceiling as I advanced into the dark. 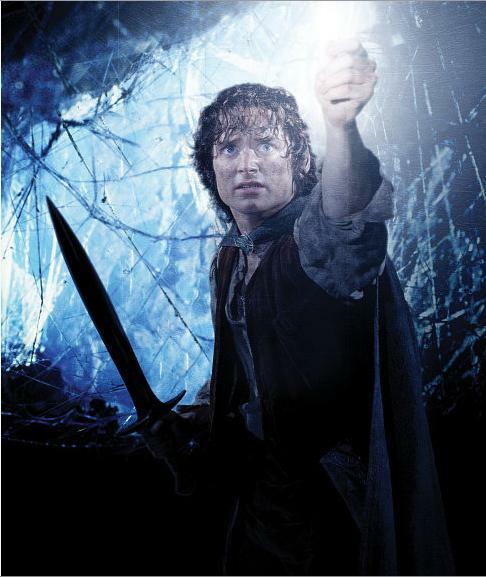 I felt like Frodo Baggins with his sword and elvish light. I got the lights on–they have to be turned on individually. Once the lights were on, I felt braver. I worked for a couple of hours and made a lot of progress. I hope to get more done later in the week.